The Chapter delegates gather in St. Catherine Chapel for their nine days of deliberations and elections. 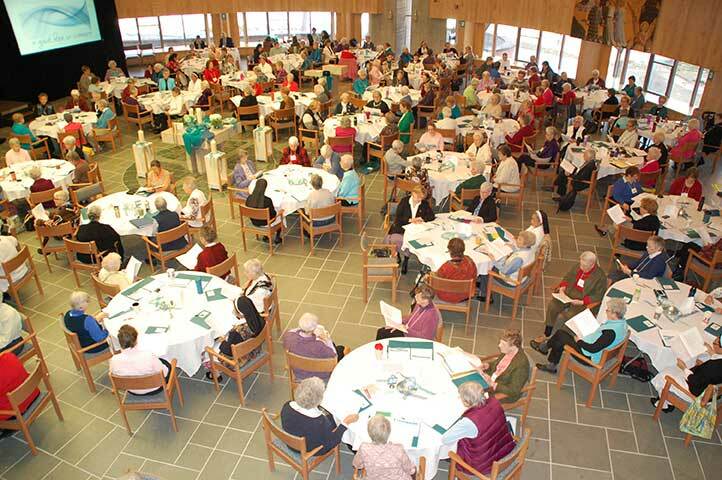 March 4, 2016, Adrian, Michigan – The Adrian Dominican Sisters, during Session II of their General Chapter, held February 18-26, 2016, elected new leaders and set their direction for the next six years. Sister Attracta Kelly, O.P., Prioress of the Congregation, lights the Christ Fire in the first session of General Chapter II, February 18. The delegates also heard from Dr. Mary E. Hunt, PhD, founder of Women’s Alliance for Theology, Ethics, and Ritual (WATER), who spoke on “Cosmic Catholicism: A New Calling for a New Order,” and from Jim Haudan, CEO of Root, Inc., who in a recorded interview spoke on catalyzing change. On the evening of the first day, the delegates gathered for the Mass of the Holy Spirit, asking the Spirit to guide them in their deliberations and elections. The Most Rev. Earl Boyea, Bishop of Lansing, presided. The 199 delegates approved four enactments to set the Congregation’s overall ministerial direction for the next six years. The 2016-2022 enactments focus on responding to . . .
the desire to nurture our rich diversity by deepening relationships with one another, inviting others to vowed and Associate life and expanding collaborations for the sake of the Mission. Sister Patricia Siemen, O.P., Prioress-Elect of the Congregation. Sister Pat is the founder and director of the Center for Earth Jurisprudence at the Barry University School of Law in Orlando, Florida. The Center seeks to develop a philosophy and practice of law that respects the natural world in its own right. She previously served as Vicaress/General Councilor of the Congregation, from 1992 to 1998, as a civil rights and immigration lawyer, and as a community organizer. Sister Frances Nadolny, O.P., Administrator/General Councilor-Elect. 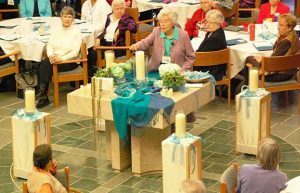 Sister Fran is the Director of the Congregation’s Ministry Trust Office, which oversees the awarding of grants to organizations in which Adrian Dominican Sisters minister or volunteer. Before that, Sister Fran had served for six years as Chapter Prioress (“Major Superior”) for the Sisters in the Detroit-based Great Lakes Dominican Mission Chapter. She had previously served in the Archdiocese of Detroit as Director of the Department of Education and Superintendent of Schools. Elected to the General Council are, from left: Sisters Frances Nadolny, Patricia Siemen, Elise García, Patricia Harvat, and Mary Margaret Pachucki. Sister Mary Margaret Pachucki, O.P., Vicaress/General Councilor-Elect. Currently President of Regina Dominican High School in Wilmette, Illinois, Sister Mary Margaret has also served as the national coordinator for literacy and numeracy in South Africa; school and curriculum consultant for the Diocese of Toledo; principal; and high school and elementary school teacher. Sister Patricia Harvat, O.P., General Councilor-Elect. Now the Vice President of Dominican Catholic Identity at St. Mary’s Dominican High School in New Orleans, Sister Pat has also served as Director of Lay Ministry Formation for the Hispanic Ministry Office of the Diocese of Cleveland. From 1993 to 1999, she served as Director of Formation for the Adrian Dominican Congregation. Sister Pat has also ministered in Puerto Rico, Peru, and the Philippines. Sister Elise D. García, O.P., General Councilor-Elect. The Director of Communications for the Adrian Dominican Sisters, Sister Elise previously co-founded and co-directed Santuario Sisterfarm, an ecology center in Texas dedicated to cultivating biodiversity and cultural diversity, and was the founding editor of Sor Juana Press, publisher of the Dominican Women on Earth series. The incoming Prioress and General Council will succeed Sister Attracta Kelly, OP, Prioress of the Congregation; Sister Tarianne DeYonker, OP, Vicaress/General Councilor; Sister Kathleen Schanz, OP, General Councilor; Sister Corinne Sanders, OP, Administrator/General Councilor; and Sister Rosemary Abramovich, OP, General Councilor. The packed schedule of Session II also allowed time for delegates to gather informally over meals and breaks. In addition to daily Eucharistic Liturgies, at which one of their Dominican Brothers presided and one of the delegates offered a reflection on the Scriptures, the delegates gathered for socials and dances. Composer and singer Sara Thomsen, whose music was incorporated into many of the Chapter’s prayers and rituals, gave a special concert on the evening of February 23. A highlight of the Chapter was a Sunday Liturgy on February 21 celebrating the 800th anniversary of the Dominican Order, the Order of Preachers, with preaching by Congregation historian and former Prioress, Sister Nadine Foley, OP. The Dominican Sisters of Adrian are a Congregation of about 700 vowed women religious whose roots go back to St. Dominic in the 13th century. The Sisters minister in 26 states; the District of Columbia; and in five other nations: Canada, the Dominican Republic, Mexico, Norway, and the Philippines. 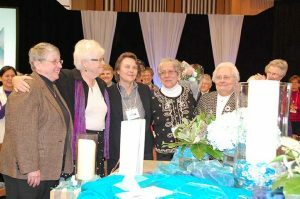 The Sisters and more than 200 Associates are organized into seven regional Mission Chapters, each under the leadership of a Chapter Prioress.